Photograph attached to scrapbook. 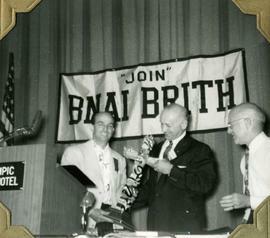 It depicts Alec Jackson (left) being presented with an award at the 95th annual B'nai B'rith District Grand Lodge No. 4 convention in Seattle.